The Red Tail Shark can be a standout in any freshwater aquarium. It is an active fish that is entertaining to watch and will provide countless hours of fun. 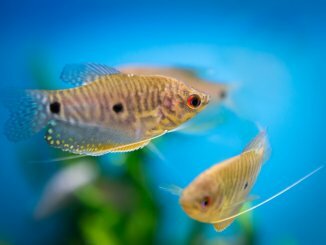 Due to their non-fussy nature, they are very easy to feed and once settled into their aquarium shouldn’t offer too many difficulties to keep happy. In this article we cover everything you need to know about the Red Tail Shark including: typical behavior, aquarium conditions, dietary needs, ideal tank mates and much more. Let’s start with a quick summary table before we move on to discuss their recommended tank mates and care requirements. Learn Even More: Download our free Red Tail Shark guide to get more information about this fish and their dietary needs and habitat. The Red Tail Shark (Epalzeorhynchos Bicolor) also known as Red Tail Black Shark, Fire Tail, Red Tailed Labeo and Red Tail Shark Minnow, is a small freshwater fish native to Thailand. It was found in the clear waters and floodplains in the MeNam Chao Playa basin, however due to excessive poaching it was thought to have become extinct. However, due to the thriving aquarium trade the breed lives on in private collections. 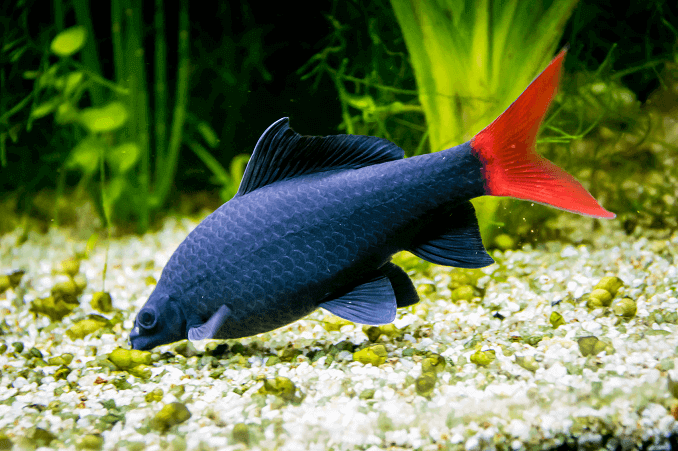 This fish is widely known for its impressive looks; it has a completely black body with a vibrant forked red tail. Despite what its name would imply, this fish is in-fact a type of carp, not a shark and belongs to the Cyprinidae family. In captivity you should expect your fish to grow up to 6 inches with most growing to 5 inches, and it should live to around 6 years old. Due to its territorial nature they should be kept in large aquariums. It is an omnivore and not a fussy eater, eating most things placed into the aquarium. As juveniles you will find your Red Tails to be fairly timid. For this reason you should provide them with plenty of spaces to hide (read the tank requirements section below for more advice). As they mature into adults they will become territorial and can be aggressive to fish which stray into their territory. Whilst they won’t physically bite or harass other fish they will chase them to the point of exhaustion. Day to day you will find this fish swimming back and to in the bottom section of the tank. During feeding time you will notice them bullying other fish if you feed them too closely together. In a very large tank (200+ gallons) with large number of hide-places it’s possible to keep several Epalzeorhynchos bicolor species, however each fish will require at least 1 meter of the tank length. 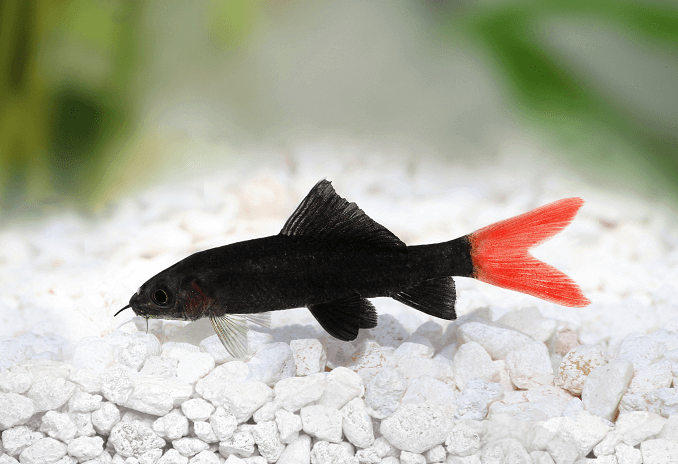 The Epalzeorhynchos Bicolor is a standout in any freshwater aquarium, with a deep black body offset with a red forked tail. It’s their dorsal fin that is similar in appearance to a shark, which is where its name comes from. Their body is long and slim with flattened sides and a curved back. As for their head, you will notice it has red eyes, and its mouth has two pairs of barbs. The shape of its’ mouth helps it to scrap algae off the bottom of the aquarium. You should expect them to grow up to 6” with most growing to around 5”. Interestingly when they are stressed you will notice their red tail starts to fade in color. At birth you won’t be able to tell the difference between male and females. However, as the female matures and reaches sexual maturity, you will notice she has a fatter and well-rounded abdomen. Finally, the Red Tail Shark is often confused with the Rainbow Shark. Whilst they do both belong to the Cyprinidae family, they are in fact separate breeds. In addition to the red tail, the Rainbow Shark also has red fins. You should also make sure not to keep your Epalzeorhynchos Bicolor with Rainbow Sharks as they will fight; more on this in the compatibility and tank mate section. 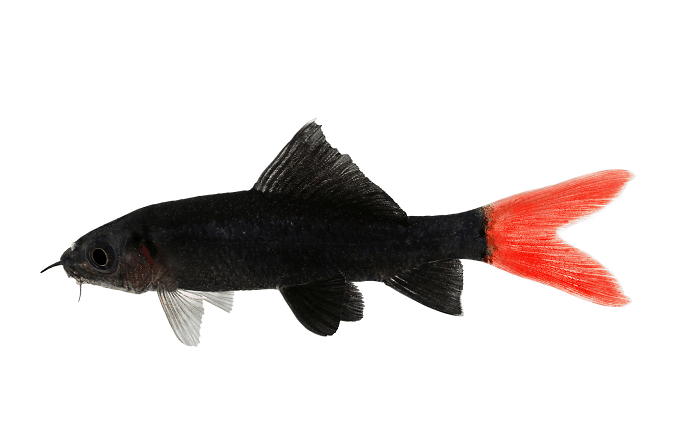 As previously mentioned the Red Tail Black Shark is native to the freshwater algae ponds of Thailand. During rainy season they will inhabit the bottom lands, streams and forest area. It is a very active fish that will spend the majority of its time “busy”. Over the last few decades the wild population of Red Tails has been all but eliminated due to industrial grade farming and excessive poaching. It is now listed as critically endangered. However, a thriving aquarium trade has meant this breed is still in existence. As they are known for being territorial (more on this later), you should ensure that juveniles have a tank sized at least 29 gallons and adults should be placed in at least 55+ gallons. You should also try to split the tank up to limit the amount of territorial behavior and help protect more timid tank mates. To split the tank up you can use caves, driftwood and ensure the tank is well planted. For the water flow you should try to make sure the water is fast flowing to replicate their natural environment. For the substrate you should be using gravel and pebbles. Also, bear in mind they can be jumpers so a weighted lid should be used. The Red Tail Shark is an omnivore and in the wild its diet will consist of plants, crustaceans and other small insects. 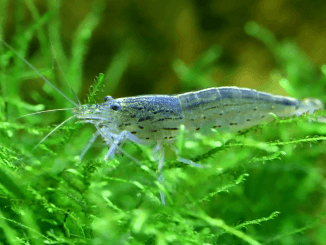 They are also known for being a scavenger and as a result will eat most things you put into the aquarium including flakes, pellets, live and frozen foods. The cornerstone of their diet should be comprised of a high quality pellet or flake. You can add some variety to this by treating them with meats and plant/vegetables. If you are feeding them vegetables make sure to wash them beforehand and quickly remove them from the tank to prevent them rotting. They are also known as an algae eater, and you will see them scraping algae from stones in your tank. Just remember that they should have more vegetables and plants than meat, and you should switch up their diet regularly to provide them with some variety. You might also consider making your own fish food to ensure they are getting the best possible diet. They have a reputation for being a somewhat aggressive and precarious fish. This reputation is rightly deserved as it a territorial fish that will become hostile should other fish enter its territory or interrupt its feeding sessions. Whilst it won’t necessarily attack and damage other fish it will chase them persistently. This can cause the bullied fish to simply die of exhaustion and malnutrition. Even though the Red Tail isn’t exactly the ideal candidate for a community tank, you can still keep it with other fish. You just need to be careful with your selection. As for fish to avoid, the list is extensive! Other sharks such as Rainbow and Red-finned should be avoided. Fish with significant red coloration can also be bullied. To be safe I would also recommend simply avoiding all other bottom dwellers including Plecos and Cichlids. Finally, it goes without saying any peaceful/docile fish should also be avoided. If you’re read above, you will know that Red Tail Sharks are extremely territorial. For this reason if you’re a beginner we wouldn’t recommend keeping more than one in a tank. However, if you are insistent on keeping more than one in your aquarium then do so with caution. Make sure you have a large aquarium; for each Red Tail you add, you need to add a minimum of 1 meter to the tank. You will also need to keep at least five sharks at once. This prevents the “alpha” from excessively bullying a single fish to death. For most fish enthusiast, a tank of this size is unrealistic hence why we advise keeping them singularly. When the females are ready to reproduce, their abdomen turns fatter and more rounded; this is the only visual difference between a male and a female. If you’re planning to breed them in your home aquarium we have some bad news. 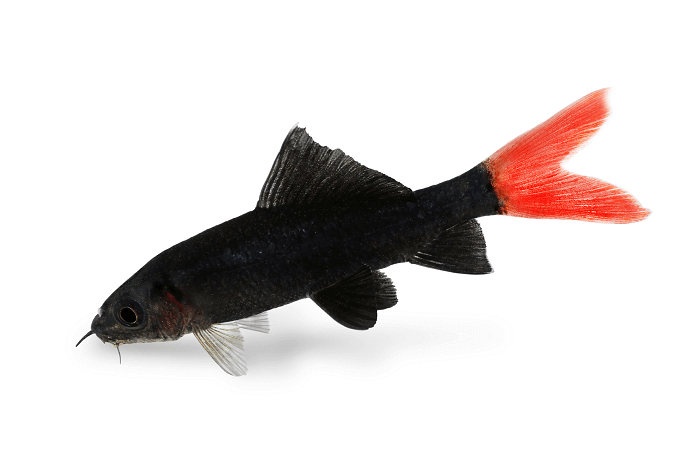 It is practically unheard of that anyone has successful bred Red Tails in a home aquarium. This is mainly because of how intolerant of each other they are. As previously mentioned, they are all but extinct in the wild, so it’s left to large commercial breeding facilities to keep them from extinction. In such commercial environments hormones are used to induce mating. As the Red Tail is an egg layer, it tends to spawn in rocky caves. 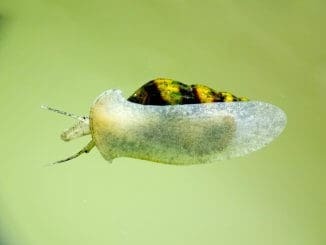 Once the male fertilizes the eggs, it takes between 40-60 hours for the fry to hatch. As the fry develop they will change in color from silver, to a silver/brown color before finally completely black. At around 10 weeks of age their red tail will develop. We hope this complete guide to Red Tail Sharks has helped you decided whether they are the right fish for your aquarium or not. Whilst they are an entertaining and beautiful fish they do present several challenges to beginner fish keepers; most notably their territorial nature and large aquarium requirements. However, if you have the space and budget for such an aquarium many of their territorial behavior traits can be avoided by using plenty of hiding places in a large tank. If you can provide them with a suitable aquarium they will make a fantastic addition to your tank, providing you with rich vibrant colors. This helped me so much. I have 2 10cm red tails in my 60 liter aquarium, im gonna go put them in my 160 liter aquarium instead then. My red tailed shark looks sick, on its left side it looks like a big Tumor ! RIgbo side is normal! Is it dying? I have a 125g tank with silver dollars,tiger Barb’s,danios, cichlids,Cory catfish, African cichlids, an upside down catfish, irridescent shark,pleco, and Columbian pictus catfish, and wanting to add my redfinned shark in with them. Does anyone know if these tankmates are compatible with this shark? Even though I have an irridescent shark. Most fish are similar size except silver dollars and cichlids. I have one with my tiger Barb’s 2 rapheal cats electric blue acara large sail fin pleco 4 Chinese algea eaters. I have a red tail black shark in a community tank. My tank is a 30 gal long and I have about 5 large rocks (35lbs) at one end. Have had the shark since it was about 6cm and it is now about 12 cm long. He is a big sissy and afraid of his shadow.. or is it my shadow. Most active when lighting is low. He has claimed the pile of rocks as his territory and will chase away any Panda Corys or Julii Corys that come inside. He is not very aggressive towards the Espi Rasboras or the Tetras at all. He is the largest fish in the tank and a great show piece. I have four guppies I thought that they would swim all over my tank but of course they stay at the top I want to get a rainbow shark I had two but they both died I love how they look and how they swim at the bottom of the tank but can I get another one and put them in my tank with my guppies. I don’t want to stress any of my fish out. Hi Cat, Guppies are quite a peaceful fish so I’d avoid housing them with Red Tail Sharks. You might want to add Danios or Tetras to the tank with Red Tail Sharks instead. Thanks, Robert.